Not content with having more 3G mobile phone users (65 million) than the entire population of the UK, Japanese scientists have achieved phenomenal download speeds on an experimental 4G network. An R& D team at NTT DoCoMo performed the experiment on Christmas day last year in Yokosuka near Tokyo using 4G technology on the 100MHz frequency. 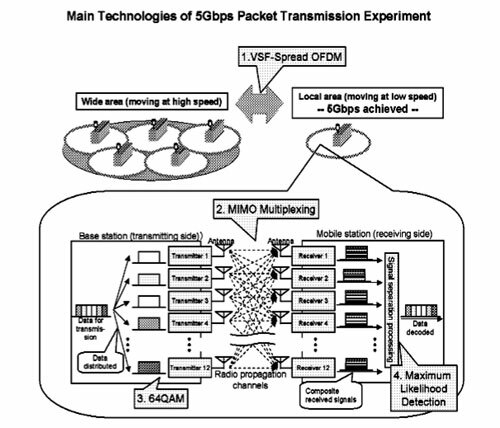 When transmitting data to a mobile station that represented a next-gen phone, the packets of information were received at approximately 5Gbps. The record speed is double that previously announced; a feat made possible using 12 MIMO antennas, while the efficiency of bandwidth usage was also doubled. DoCoMo’s trials are not just for bragging rights – the company admits it is hoping to get a jump on competitors in the race to develop the technological standard for the next generation of mobile phone networks.